Although still relatively new in the Sinn Collection, the Sinn 104 I has become one of the best selling watches in the company's history. This watch design takes Sinn back to its roots - a simple design without clutter and without gimmicks. Although this watch has design cues from chronograph watches, it is not a chronograph but rather a time, day, date and rotating bezel watch. Despite the aggressive pricing on this watch, Sinn has taken no shortcuts. The base movement is chronometer grade equivalent, sapphire crystals are used on both sides, and the look and finish of the case leave no doubt that it's a Sinn. This pilot's watch features a highly legible matte black dial, and the watch is water resistant to 200 meters. The ratcheting bezel is of Sinn's design and will not snap off the case if hit due to its screwed bezel construction. This watch has become a true Sinn classic in a very short amount of time. Verified Owner Comments: First, I was pleasantly surprised I found the watch, which was a Sinn 104. I called and asked several questions about the watch. Watchbuys were extremely knowledgeable and speedy in response time. Then they called right before to clarify all costs and shipping process before the watch was shipped out. It took no time for the watch to arrive. Upon arrival, it was everything I wanted and more. I’ll gladly buy from Watchbuys again. I’m currently planning my next purchase for my next Sinn as well. Not only do they have Sinn, but quite and eclectic brand off all other watches and watch brands. I thoroughly enjoyed my experience with Watchbuys. "Fantastic watch and buying experience"
Verified Owner Comments: I couldn’t be happier with my first mechanical watch purchase. My 104 I St Sa on Strap met and exceeded my expectatations. My Watchbuys experience was top notch. A nod of the hat to Matt. Great service! I originally was looking at this model on fine link bracelet. But due to to it being Christmas is was not available. However, on the leather was. And after many emails with Matt, who patiently answered all, I made the purchase. Along with a deployant clasp and a fine link bracelet separately. Matt ensured the watch, clasp and bracelet shipped as one. Plus, as requested, they set the day window to German. I can’t say enough positive things. Happy with my watch and the overall experience. Already looking at my second Watchbuys Sinn purchase. Verified Owner Comments: Excellent service and very quick shipping. The watch arrived in perfect condition and I’m absolutely satisfied with the purchase. "Sinn 104 I St Sa A"
Verified Owner Comments: Excellent blend of functionality and class. Retired F15 & 737 pilot. Past watches: Breitling Aero and numerous Casio. Came with grey strap. Keeping it. Wrist 6 3/4, short is perfect. Coloring and configuration of face is spot on. "Best service I've ever received!" "One of the 104's Many Personalities"
Verified Owner Comments: I was on the fence between the 104 on a fine link bracelet or this beautiful dark brown heavy leather strap. Not wanting to have to frequently switch bands, I eventually bought both watches (see my review of the fine linked 104). The leather completely changes the personality of this piece by adding a vintage pilot watch vibe. If you're looking for an uncluttered, classic, yet masculine watch to go with your wardrobe's brown leathers, this one's a no-brainer. Purchase with confidence with Watchbuys' super-efficient client service. "Great experience all the way around!" Verified Owner Comments: Sinn 104 I is my first automatic watch could not have picked a better one to get me hooked! Love the look and quality of Sinn as good in person as the reviews I had read. Purchase through Watch Buys was incredible the experts here answered all my questions and provided some extra advice for upkeep and maintenance. Could not be more pleased with both the watch and WatchBuys! Verified Owner Comments: Love the watch. Switched out the strap for a more comfortable (to me) Hirsch black leather strap. This has become my daily wear watch - even after scratching a lug within the first week. It runs consistently 3 seconds fast per day. I have to remind my self to wear my other watches instead of the Sinn. (Stowa, Hamilton, Seiko, Omega) The only thing I would change about this watch is I would prefer a beaded/blasted case rather than polished. I have to say the customer service with WatchBuys is stellar. I definitely plan to purchase from them again. Verified Owner Comments: Heard a lot about this watch, and was not disappointed to have bought it. Everything about it is awesome. Excellent timepiece, and had a great experience buying from WatchBuys! "Beautiful, Meticulously Crafted Piece of Art"
Verified Owner Comments: I cannot be more impressed with the Sinn 104 ST SA. Its beauty cannot be accurately described without seeing it yourself in person. It's so German - and I mean that in the best way. Every thing fits well, looks premium, operates seamlessly, and has the marks of a true craftsman. I would highly recommend this watch as an Automatic Starter Watch. The price point is great (relatively speaking) and the piece will last you a very long time. For all you American buyers, please don't fret - Watch Buys is legit. I was a little sketched out at first, but their customer service is phenomenal and everything I received is legitimate. Seriously watch collectors, you NEED to own this watch. "Fantastic Sinn 104 and Service!" Verified Owner Comments: First time buyer from Watchbuys and I have to say the service was great. The staff were knowledgeable and explained the delivery process to Toronto, Canada thoroughly and were accurate with their details. I purchased an alternative Sinn strap and deployment clasp which was swapped onto the watch before shipping. The quality of the Sinn 104 far exceeds the price point, even with the brokerage duties and Canadian taxes added on. Verified Owner Comments: I have been pondering buying this watch for a long time. The price was a factor, and I just couldn't commit, but when the price increase was announced, I knew it was now or never. Am I glad I bought this watch! It's beautiful, but it's much more than that. You know right away that it's a quality timepiece as soon as you open the box. I love how it looks and feels on my wrist, and it keeps great time. I've read where the 104 is described as an everyday watch, and it's true it gets most of my wrist time. The attention to detail is excellent, including the minute track around the dial, the day-date complication, and the wonderful bezel, which is a pleasure to use. And it's such a visible watch, with excellent contrast. Plus the beautiful case back. Watchbuys has excellent service, and they, and the Sinn 104 are highly recommended. Verified Owner Comments: There’s not much else I can say about this wonderful piece that hasn’t already been said by others more eloquent than myself in describing its virtues. The build quality is fantastic and it’s easily the most comfortable watch I’ve owned. Buying experience was top notch. "Sinn 104 st sa i"
Verified Owner Comments: Love this watch, immediately my favorite watch out of my small collection. It fits great on my 7.5 in wrist. Feels and looks like absolute quality. Was worried about buying it without seeing it first but definetly didnt regret the purchase. The leather brown stock strap is a little tough so I replaced that and the is receptive and visible but the lume does not stay bright as long as I expected. Other than that this is a awesome watch. "A Must Have Time Piece"
Its been less then one week since receiving my Sinn 10104 Sa St I.. After many months of researching the right watch for me, I pulled the trigger on the Sinn. I have Have to say, although it's not on of the big brand luxury brands that I was looking to purchase (all would have been preowened based on my budget) Sinn is certainly a contender. The fit, form, and functionality in my opinion is bar none at this price point. I've received complements from strangers while just standing in line at the store. Anyway, if you're on the fence , dont be. Even if you can afford a more luxurious watch, add the Sinn 104toyour collection you wont be disappointed. After one week watch accuracy is + 1.8 s/day. Im extremely happy with this. Well with in the -4/+6 Cosc cert. One finally note. Watch buys is top notch. They take their business serious and seem to understand the value of not only the time piece we are purchashing bubut the value of the individual making the purchase. Verified Owner Comments: This is a retirement present to myself for 47 years of work, and everything said about this watch is true. I couldn’t be more pleased with it. Fit, finish, precision, and drop dead good looks makes this watch as good as any of the Omegas and Tudors I’ve put on my wrist. Go ahead and watch the YouTube reviews. It’s accurate as all get out. Everyone raves about it. Just buy it. But one suggestion.....the brown leather strap is thick and very high quality, but I put a black cowhide alligator print strap with white stitching on it, and this thing just pops. Stunning combo in my opinion. Verified Owner Comments: I finally purchased this watch after months of agonizing as to whether I should spend over $1000 for a watch. After all, I have only been collecting watches for just over a year, and had yet to pull the trigger on a $1000+ watch. It was also my first time buying from Watch Buys. I'll be the first to say that It was well worth the investment. It is a beautiful well build piece which I feel will remain in my collection for many years. Watch Buys was also very easy to deal with. Ordered over a weekend and heard back from them first thing Monday morning. Shipping was fast, and I had my watch within two days. Will definitely purchase from them again. I'd been wanting to purchase a Sinn for a while after seeing numerous articles and reviews about their build quality and good looks. I finally made the decision to purchase the Sinn 104 on leather strap and have no regrets. I was a bit nervous at first as this is the most money I have ever spent on a watch. I was not disappointed. It is a stunning looking watch, that feels like it is built like a tank. An added benefit is this watch is a strap monster. I have tried it on several Nato straps and two different leather straps and it looks great on all of them. I used Watchbuys free shipping and it arrived well packed in only two days via Fedex. I would definitely buy another Sinn and use Watchbuys again. The watch is unquestionably worth every penny of the asking price and is everything you hope it will be. The WatchBuys service was also phenomenal and I would purchase through them again- overnight shipping to Canada is pretty wicked. I give the highest recommendation to anyone considering this glorious chunk of Germany. I've been building my collection for a few years and my Sinn 104 purchase was a memorable intro to Sinn timepieces. Many positive words have been written on this piece: great value proposition, perfect, useful, defines what a tool watch is....these are all true and my research kept nudging me to the WatchBuys site. When my 104 arrived I knew I'd made a good decision. Key for me is legibility - can I glance at my wrist and retrieve the info I need quickly and accurately? You bet - This piece really delivers. (With a longer glance the time info is enhanced by an accurately subdivided dial and both day and date complications). Add a level of comfort and wearability - from a perfect case shape and size - including an overall height that allows you to forget it is there - and you do have an almost perfect piece with equal measures of value proposition, usefulness, and tool-icity. Get off the fence. You won't be disappointed. "Excellent Watch and Fantastic Service"
Verified Owner Comments: I purchased this watch as a gift for my husband. He was impressed with the design, quality, and craftsmanship. It's a beautifully elegant timepiece and has hardly come off his wrist since he received it. The service from WatchBuys was incredibly friendly and efficient. I would not hesitate to buy from them again (in fact, I just placed another order). I couldn't possibly recommend them highly enough. "Sinn 104 I St Sa on Strap"
Verified Owner Comments: I had considered many different watches before settling on the 104, and I feel like I made the right choice. The fit and finish of the watch exceeded my expectations from the pictures I had seen online. The watch is comfortable, accurate, legible, and engrossing to look at. I have a 7 wrist and I'm using the smallest hole in the strap, so if you have a smaller wrist you should consider a different strap. The phone call from Watchbuys explaining the process and answering questions was a nice touch. "Sinn 104 I ST SA"
"SINN 104: An Almost Perfect Watch"
Verified Owner Comments: The watch is beautiful, refined, and elegant. I get a lot of comments about it, and I love to wear it. The only drawback was the cheap leather strap. 9/10! "Amazing! Worth the price and wait.."
Verified Owner Comments: As of right now the most splurging I've done in a watch ever and absolutely worth it. The detail, the quality, the way it wears, the size, amazing... I couldn't be happier. Recommend it. Buying from watchbuys was very pleasant as well, from the fast notification that this was back in stock to the call right after ordering. Not to mention the fast shipping. Thank You! Verified Owner Comments: Just received my 104 I St Sa on Strap and it's everything I thought it would be. I'm super happy with this watch and it's pure simplicity make it pure class! Everything about this watch is desirable: perfect size, simple dial, great lume, display case back, etc, etc. The thick leather strap is absolutely awesome! I put my name on the notification list about 2 weeks prior to getting notified that a fresh shipment had arrived. Within 2 minutes of getting the email, I placed my order and they were sold out again just a few hours later. If you're one the fence, don't hesitate, as this one is a keeper for sure! Verified Owner Comments: I have been eyeing this watch for months. Just happy finally got it. The quality of this watch is top notch. Watchbuys got amazing customer service and fast shipping. Verified Owner Comments: Just received the watch and I got to tell you, this watch is amazing. The quality is top notch and the packaging by Watchbuys was excellent. I would be proud to pass the watch down to my children. Great overall experience. Watchbuys....you done good! Verified Owner Comments: This is my first watch over about $250 and it is well worth it. Looks great and is well built. I don't think it can be beat in this price range. Also watchbuys called me to follow up after order which was really cool. Great overall experience! Verified Owner Comments: Absolutely stunning watch. Pictures do not do it justice. Watchbuys was great to work with fast shipping. In love with this watch. Verified Owner Comments: I could not be happier about my 104 and my purchase experience. Shortly after ordering, I received a phone call from a nice gentleman who reviewed my purchase details and carefully explained the return policy, so that I could consider the piece and return it if not fully satisfied. No danger of that, as the watch is brilliant. "Jack of all Trades, and master of .. well all of them"
Verified Owner Comments: An outstanding timepiece! Sinn went well beyond the price point on this one with the evidence seen most in an incredible bezel, and finishing to the movement that is unexpected for a tool watch but feels appropriate for what has been done in the case, and dial work. Verified Owner Comments: I chose Watchbuys for my first Sinn purchase. The Sinn arrived in perfect condition and was already set to correct time and date. The Sinn 104 is so easy to read, wears wonderful on the wrist, and the lume is legible all night. The customer service I received from Watchbuys was simply outstanding. Verified Owner Comments: I recently purchased a Sinn 104 I St Sa. It arrived very quickly. Upon opening the packaging and box I was immediately impressed by the overall build quality. This watch is beautiful. The pictures don't do it justice at all. After having worn it for a week, I find it very comfortable on the wrist. The lume is very bright and long lasting. My watch is running + 2 to 3 seconds a day. Certainly within COSC standards. This has become a true favorite. "Great watch & excellent customer service!" Verified Owner Comments: I bought Sinn 104 I St Sa for my son, and he is very happy. The watch is very beautiful and high quality, and the WatchBuys customer service is awesome,too. I strongly recommended to anyone to buy watch from WatchBuys. Verified Owner Comments: I Love the Sinn 104, I have not taken it off my wrist in the past 2 weeks since it has arrived. I own several Rolex Subs, and other high end and mid tier watches. What I like about this watch is there is nothing else like it. The dial is easy to read, the lume is great and I just love the style. "Highly satisfied with the watch and the store"
Verified Owner Comments: I have been eyeing this watch for quite a while to add to my collection. On receiving the watch, I had some concerns about an accessory because I had seen differently elsewhere. Matt from the store was kind enough to call back and alleviate my concern. This is what sets Watchbuys apart from the other places I have purchased other timepieces and I am highly satisfied about this purchase. I will definitely return to Watchbuys in the future. "Sinn 104 on leather strap"
Verified Owner Comments: As some have said before, the watch, when you open the box and first put it on, is even more lovely than all the pictures of it from any source. Purchase and delivery next day were seamless. Very happy with the watch and the experience of buying it from WatchBuys. 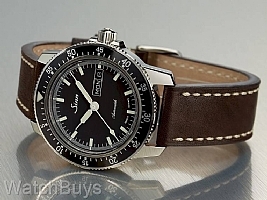 Verified Owner Comments: I've been looking for the best Sinn watch, and I found what I'm looking for! This watch, I believe is a classic and absolute pure class. The design is simple, and yet very elegant and crisp! Some watch enthusiast, will think that this is a homage but for me it has it's own character and Sinn built its name outstandingly! Highly recommended! A perfect everyday watch in my opinion. Thanks and best regards! Verified Owner Comments: I bought the Sinn 104 and I’m very impressed with it. It’s well suited to compliment the way I think about tasks. The bidirectional countdown bezel provides a constraint-based approach to referencing discrete intervals. Simply register the desired time span on the bezel to the minute hand and the pip provides the end point. Measuring arbitrary elapsed time is just the inverse: align the pip to current time and subtract the end point from sixty. Simple. I’m a design consultant. This watch is a tool. It delivers big on intent and quality. The manufacturing is superb. My experience with WATCHBUYS was pleasant. I like their business model and look forward to my next purchase. Verified Owner Comments: I absolutely love my Sinn 104 I received it on time and as promised. It has performed wonderfully and was packed and shipped perfectly. In addition I was hesitant to purchase a premium watch online but when in the process I ordered a deployant clasp for the strap I mistakenly ordered the wrong size. The guys at WatchBuys caught my mistake and immediately notified me and corrected the order. Overall I am very pleased with my purchase and will be dealing with these guys in the future. "My First Sinn and Watchbuys experience"
Verified Owner Comments: I was exposed to this watch via online videos and reviews, along with Watchbuys, so bought it without having seen it in person. When I received the watch it was better than expected! Attractive finish, great bezel, nice lume. Also pleased with my ordering experience through Watchbuys. Shipping was fast, the time was preset, service was great. Verified Owner Comments: Great purchase experience. Very informative staff when I called in to discuss the watch. My 104 is keeping excellent time, (-5 over 7 days) I'm very pleased with the quality and how it fits. Verified Owner Comments: Absolutely love the watch....first watch arrived on Friday afternoon with day of week not functioning. I called Monday and spoke with Kevin who was immediately sent me a prepaid return label and sent me a new watch with next day delivery. Verified Owner Comments: This is my first Sinn. The watch is absolutely flawless, a word that I seldom use its appearance, fit and finish are impeccable. I received inquiries and compliments the very first time worn. Coming from a Rolex Submariner owner, with its keeping chronometer spec time, and at its price-point the Sinn 104 is an incredible value. My first experience with WatchBuys was absolutely seamless speaking with a knowledgeable representative is exactly the type of customer service I expect ... and received. Well-done WatchBuys! Next on my list a Sinn 103 chronograph. "Sinn 104, An Awesome Watch"
Verified Owner Comments: My first time spending over 1K on a watch and I love it! The design is so nice it works in formal settings and as a casual daily beater. The decorated movement is nice, the countdown bezel is cool and the lume is great. I never exactly measured its accuracy but I haven't had to adjust it in the 2 weeks I have worn it (although I don't mind having all my clocks ahead so I am never late). My only few gripes with the watch are the faint crackling sounds when screwing the crown, the rough winding and the rather low power reserve. Great watch, worth the price. Verified Owner Comments: I bought this watch after agonizing I've a number of brands and models. I have an Omega Seedmaster Professional already, and was looking for something more robust (waterproof, sapphire crystal) yet good looking for everyday wear. I was a bit nervous about buying the Sinn without being able to try it first, but I have no regrets. It is beautiful in person. I love the simplicity of the dial (I got the version with indices, not numerals). I love that it goes with nearly any strap, from bright coloured to more muted (I took the OEM strap off right away and starting trying NATOs on, I didn't find anything yet that didn't look good with the dial.) Good for the weekend or work. So much flexibility. And I didn't have to spend Rolex or Omega dollars to get it. I think I have found my perfect watch. Verified Owner Comments: The 104, like all Sinn watches is overbuilt. You have a sense of confidence that the watch will hold up to everything your day has to offer. The face is very readable to these 55yr. old eyes in all situations. Included are day/date complications with a hackable second hand and a countdown bezel. The thick leather strap included with the watch is substantial but pliable and supports this watch well. The 104 is a solid daily wear watch that is up to the task.....and more. Verified Owner Comments: Love this watch. Visually striking and has kept great time since I got it. "Some Surprises But Great Watch"
Verified Owner Comments: Watchbuys is great. An over zealous card company held up the sale and Watchbuys was very helpful. I received the watch in a couple of days. I was surprised that the beautiful, rippled leather strap was so large. I have a medium sized(7.5inches) wrist and am in the next to last hole with the buckle adjustment. Also the description of the dial was black and it is really dark gray under good light. The background for the day/date is significantly darker. Nevertheless, I love the watch. It is beautiful and easily the nicest watch I have ever owned. "Excellent Watch and Service from Watchbuys"
Verified Owner Comments: Received the watch in flawless condition and was pleasantly surprised to find that the watch had been set to the correct date and time for my time zone and was still running! An impressive feat given that this watch only has a 38 hour power reserve. A+ service from Watchbuys. Verified Owner Comments: Amazing watch and even better customer service. The gentleman who helped me we was awesome and answered all my questions. I am super happy with this purchase and will be buying another Sinn from WATCHBUYS down the line. The Sinn 104 is nothing short of spectacular, the quality and look of the watch are everything if not more of what I expected. "Excellent watch and even better service"
Verified Owner Comments: I pre-ordered this watch before it was in stock and was told it would be a few days until they came in. That was fine with me as these watches sell out often. I received a call 2 days later to let me know it was in stock and would be mailed that evening. 2 days later I received the watch. The Sinn 104 is an excellent watch and the service from Watchbuys was extraordinary. Excellent watch and even better service. Verified Owner Comments: Firstly, Watchbuys is helpful, and quick to ship. The watch represents good value for the money. Depending on one's taste, it is a handsome, well proportioned piece that is not overstated. It exudes a classic appearance. Moreover, the rich brown strap complements the case and dial of the watch nicely. It's a style of watch that can easily be made to provide different appearance's with the change of the strap, if desired. Mechanically, it keeps time about the same as my Damasko DK 201 GMT. No complaints there. Nice lume in low light too. If you're considering this piece because it catches your eye, go ahead and ease the throttle forward. You'll be pleased. Verified Owner Comments: Amazing build quality and it keeps good time. I'm happy with this purchase. So far I have experienced great customer service from WatchBuys and I would recommend purchasing from this avenue. "everything they say it is"
Verified Owner Comments: I've been considering the Sinn Brand for a very long time. I finally bit the bullet and purchased one. I was so happy with it I purchased another immediately. I now have the 104 and the 857. Can't be any happier with my purchase. Verified Owner Comments: At first glance it doesn't look like much. Slowly but surely it grew on me. Now it doesn't leave my wrist. In this price range there is no other competition. Verified Owner Comments: Hi just a quick note to say how pleased we were with the purchase of the sinn 104, a very beautiful watch, its quality speaks for itself. Verified Owner Comments: Love this watch! Verified Owner Comments: The Sinn 104 is a fantastic watch. It looks so much better in person, and it's so comfortable to wear. I currently have it on a black nato, and it's a stunner. The watch is also pretty accurate for the price. There are a lot of ETA fanboys I included, but this movement doesn't make me miss an ETA movement at all. I love the contrast the black dial and bezel and stainless steel body. It just pops. This probably the best mid-range piece out there for the price. The built quality is superb, and the design is timeless. You will not be disappointed with your purchase. Verified Owner Comments: Customer service at WatchBuys is outstanding. They called to confirm and answered all my questions. Shipped to my house in two days and I'm on the west coast! The watch is fantastic, very high standards for the price. If you've been eyeing thie 104, buy it! Don't wait as long as I did because it sold out earlier this year and I had to wait a few months. Great watch, great service! wouldnt hesitate to purchase from WatchBuys again. Verified Owner Comments: I ordered this through Watchbuys after months of thinking about it in the back of my mind. I chose their fastest shipping option and it arrived at my place about 3 days after the order was placed. Because I was a first time user of the site, I called their customer service line to verify some of my details and the person I spoke to was very helpful. As for the watch itself, it's already my favorite daily wear. The clean matte dial looks beautiful in contrast with the glossy bezel and polished case. It's the perfect size for me, and the lugs aren't too long. It can also be dressed up or down with virtually any strap. I've been recommending the Sinn 104 to anyone who asks about it, and I'm extremely happy with my purchase. Verified Owner Comments: User-friendly website, fast shipping, personal follow-up - WatchBuys is a top notch operation. Verified Owner Comments: The watch is a beauty in person. Clean and simple dial, comfortable vintage brown strap, super smooth bezel. Just an overall great piece from Sinn and for a great price too. Great experience with ordering, very professional. Verified Owner Comments: The Sinn 104 is an exquisite combination of tool watch meets dress watch - a balance that sets it apart from the crowd. The 41 mm dial along with the brown/black leather strap are a feast for the eyes and the fit is precise around the wrist. It's been on my ' get list' for a few years and I'm glad it became available. If you've been staring at it like I have, buy one. It's a keeper! Verified Owner Comments: Satisfaction with the product I selected may have exceeded my expectations, but getting a personal call regarding shipping and thanking me for choosing watchbuys showed class and made me feel like an important client. Will do business with them again. "Sinn 104 I St Sa - The Masterpiece"
Verified Owner Comments: I am a small scale watch collector and never considered a German watch before. Boy I was really missing a lot. This is handsome piece of art. I feel like a million when I wear it and it is noticed by others very I'm proud to say: "Its German not Swiss and I love It ! " I look forward to adding another Sinn to my collection. A suggestion would be to add a 18k solid yellow gold Two-Tone with a Blue dial. I think that would be a wonderful piece. Additionally, WATCHBUYS is the place to go real pros very happy with the service I received. "Sinn 104 St Sa on Strap"
Verified Owner Comments: The watch itself is beautifully made - classic German engineering, in all its handmade glory, it has been a purchase so very worth it. You can't really see it in the photo but the strap is a rich, dark brown and it looks great - super versatile. Also, the delivery experience was just absolutely incredible - I ordered the watch on a Wednesday and as soon as i placed the order, i received a call to confirm the order in the next few hours. They confirmed I had ordered the watch i wanted, confirmed my address and informed me the watch would ship that same day. I was then informed that the watch had arrived in Canada on the Thursday and following duties and such, I had the watch in my hands by Friday! Verified Owner Comments: Great everyday watch. Not too small or too large with a nice clean dial. the lume is also very good. The service provided by WatchBuys was also top notch and I'm looking forward to my next purchase. Verified Owner Comments: Love everything about this watch! Motion is great, has a nice clean look, and works for both formal and informal occasions. The strap is comfortable and adds a bit of a rustic look to the watch. Great value, couldn't be happier! "A countdown bezel at last!" Verified Owner Comments: Have had this watch for a couple of weeks now; it is the right size, is comfortable on the wrist, keeps very good time, and the lume lasts well into the night. Sinn has a winner here. Verified Owner Comments: Bought this as a gift for my father-in-law when he turned 60. He's been wearing it almost every day and he absolutely loves it, this watch is built really well, it looks great on the wrist and the best part of the watch i think is the contrast between the white and the black. Also, it's really worth mentioning that as soon as i ordered online, i received within 24 hours a call from WatchBuys explaining the process, describing the watch and the tests they perform, confirming that they'll be shipping it right away, which I promptly received a confirmation of.... bottom-line, great people to buy a watch from, very knowledgable and extremely professional! Same experience I had at their roadshow in NY. Verified Owner Comments: I've been wearing this for about a month now. It is perfect as an every day wearing watch. Not too large, not too small, robust, solid, and ready to take a beating. I also enjoy the vintage aesthetic and simplicity of the face. The lume is pretty good too. Verified Owner Comments: The 104 is a no brainer. The size is excellent and a very comfortable watch to wear. I don't time watches but after a day of wear it's right on with my iPhone. I'm not much for the strap but that's personal preference. One thing that I was really pleasantly surprised with is the lume on this watch. It is fantastic! Recommended. Verified Owner Comments: This Sinn 104 is an exercise in simplicity, practicality, and reliability... all in an aesthetically pleasing timepiece. I am a professional photographer who sometimes photographs at nights, using long, manually calculated exposures. While legibility in the daytime is extremely good, I love the legibility of this timepiece at night! If the lume is well "charged" I can work for hours into the night. Give the way I use this timepiece, an added benefit is that the rotating bezel is of a "count down" design rather than elapsed time (like most dive watches). While I can work with either, it is far more convenient to know that my exposure is finished when the minute hand reached the "pearl", as opposed to counting minutes from the "pearl" to control my exposure times. I would have no hesitation in recommending the Sinn 104 St to anyone who needs a simple but well built timepiece, capable of filling many different roles.